Below is the screenshot of a passage from 'Oxford Guide to English Grammar by John Eastwood'. The passage says A clause has a subject and a verb. Subject and Verb are the elements of a sentence or a clause. However, in the clause Our flight time will be approximately forty-five minutes there is another 'sentence element' which is complement which is other than the 'Subject' and 'Verb'. However, the passage says that 'there can be other phrases, too.' What is meant by 'other phrases, too' here? Does it mean other sentence elements, like complement? Or does it mean the types of phrases other than 'noun phrase' and 'verb phrase'. My main question is: In the examples of the clauses given in the passage, the clauses contain more than a 'subject' and 'verb'. They also have 'complement parts'. The 'complement' and 'verb' part of the example clauses have been shown to be separate or distinct. My second question is: Does the author clarify further in the passage that 'complement' can be part of a clause? In grammar, a clause is the smallest grammatical unit that can express a complete proposition. A typical clause consists of a subject and a predicate, where the predicate is typically a verb phrase – a verb together with any objects and other modifiers. The above definition of the clause includes objects or complements in 'verb phrase'. Does the author clarify further in the passage that 'complement' can be part of a clause? To take your last, main question first, No, Prof. Eastwood does not make this clear in the snippet you provide. However, it may have been made clear earlier, or it may be made clear later, after Prof. Eastwood has laid what he considers an adequate foundation. What is meant by 'other phrases, too' here? Does it mean other sentence elements, like complement? Or does it mean the types of phrases other than 'noun phrase' and 'verb phrase'. It appears that Prof. Eastwood is building his introduction to syntax on the phrase, so I imagine that he means phrases of all types, and that he uses the term phrase in a fairly narrow sense. His approach is by no means universal in grammatical discourse; verb phrase, for instance, in many grammars denotes not just the few words will be but "the entire string of words governed (or headed) by a verb". Your quotation from Wikipedia employs 'verb phrase' in the latter sense. Traditional grammar, on the other hand, calls what Prof. Eastwood identifies as a 'verb phrase' simply the verb. So as you can see, the matter is complicated by critical terminological differences; and we haven't yet even started to address what a clause is! I am not acquainted with the Oxford Guide to English Grammar, so I cannot be sure; but it seems to me that Prof. Eastwood is trying to build your house from the ground up, brick by brick, rather than exhibiting its overall design first, and only then showing you where the bricks fit. I therefore suggest that you would do better to take his study in larger chunks. Read through an entire chapter to get a sense of his argument; then go back and reread, and perhaps everything will be clearer. If anything still baffles you you will at least be able to bring us specific, narrow questions we can handle within the 200-800 words of an ordinary answer. I can see why Eastwood's explanation might be a bit confusing. 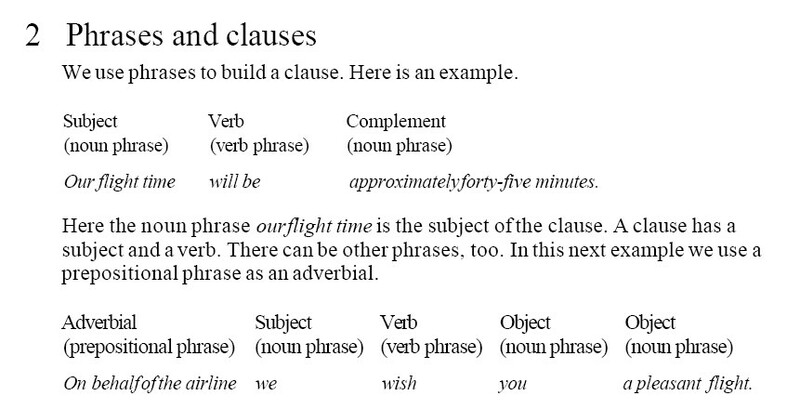 A clause consists of at least a subject and a verb; but most clauses contain more than just those two parts. All the phrases/constituents that Eastwood uses in his examples are parts of clauses: each of his examples is in its entirety a single clause. So neither clause contains only a verb and a subject. His "other phrases" include the complement he uses in his first example, and also the other phrases in his second example. Wikipedia apparently uses a different terminology, where the "verb phrase" includes all constituents except the subject, whereas Eastwood includes only verbs in his "verb phrase". Note that the terms "phrase", "predicate", "verb", and especially "verb phrase", are used to mean different things by different people. I agree with you that Eastwood should have been more precise and complete in his definitions! The word "phrase" has multiple definitions. In general it means any group of words that work together to convey meaning. Here the author seems to be using the more specific definition that a phrase is a primary part of speech, like a noun or verb, together with any modifiers. Thus, "dog" would by itself be a very simple phrase. "The big dog" is a slightly longer phrase. It includes the primary noun "dog", along with the modifying adjectives "the" and "big". A "clause" is a group of words with, at a minimum, a subject and a verb. Thus, "The dog barks" is a simple clause. It includes a subject, "the dog" -- which is itself a noun phrase -- and a verb, "barks". A clause can have other words besides the simple subject and verb. You could, for example, say, "The dog barks at the tall man." "at the tall man" is a prepositional phrase that conveys additional information. A sentence can have more than one clause. Example: "I got a job and I paid my bills." Here there are two clauses, "I got a job" and "I paid my bills", joined together with the conjunction "and". Not the answer you're looking for? Browse other questions tagged phrases understanding or ask your own question. How to analyse 'than seeing Santa'? Clauses and Phrases: When does a new independent clause begin?